When I was growing up, Chinese food was a real treat. We ordered pizza every Friday night, but Chinese food was reserved for special occasions like birthdays. As a result, I have a deep-seated love for it. As I've gotten older, I've had the chance to try more traditional Chinese foods, and I've found them all delicious, but all of them still pale in comparison to my favorite dish from birthdays of yore - General Tso's chicken. Wikipedia tells me that the dish was named after Zuo Zongtang, but actually has very little to do with him, or with traditional Hunan cooking. When I became a vegetarian, it was one of the things I missed most. Until, that is, my friend Jenny introduced me to General Tso's tofu from Sun Xing. 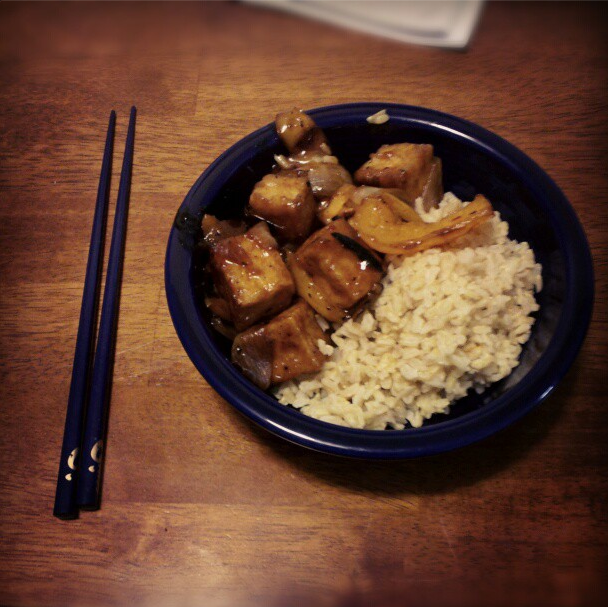 I'd had tofu before, but I'd never had it crispy, and this really changed the way I viewed it. I still enjoy it unfried (it's a bit healthier that way), but once I had it fried that first time, I was addicted. And yet, somehow, I let seven years (yes, seven!) pass before I made it myself. I have no idea why it took so long, because it's so easy! Press the tofu. To do this, take it out of the packaging and put it in a bowl or pie plate. Place a paper-towel on the top, and then put a heavy bowl, pot, or plate (or several) on top. Let it sit like this for about 10-15 minutes, as water pools up into the bottom. Now is a good time to chop up and begin to sauté the vegetables you will want to mix in (I used onions, peppers, and green beans). Mix the flour and cornstarch, and put it in a bowl or plate. Once the tofu is pressed, cut it into 1-inch cubes. Roll each cube in the flour-mixture, making sure to cover all sides, as if you were covering them in batter. Pour your oil into a pan and begin to heat it. It should be about an inch deep, although I used less, and just had to turn the tofu chunks more than once so they cooked on all sides. It should be hot enough that it begins to sizzle as soon as you put your first piece of tofu in. Fry the tofu until it is golden brown on all sides. You may have to do this in multiple batches, depending on how big your pan is. If you have a deep-fryer, you could also cook them in that. Once the tofu is finished, I mixed it with the sautéed vegetables, and covered them in the sauce. I used Trader Joe's General Tso sauce, and it was delicious, quick, and the sauce has mostly recognizable ingredients. But, if I had a little more time, I would definitely try to make The Culinary Couple's sauce, substituting vegetable broth for the chicken broth. Emily's recipes are always delicious, and I'm sure this one is no exception, so if you're looking to make everything from scratch, give that a try and let me know how it goes. Served over brown rice, this was a delicious meal, and one that came together pretty quickly. During the time it took to cook the rice, I made everything else, so it probably took about 50 minutes total, and was definitely worth it.